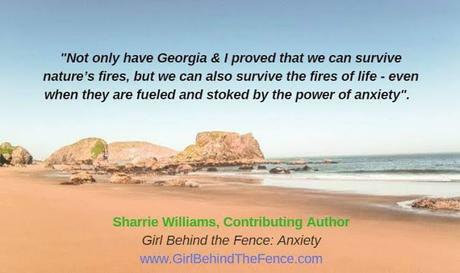 Girl Behind the Fence, a New Book on ANXIETY, Comes out April 6. I'm a Contributing Author. Here's a Bit of What I'll Be Writing About. 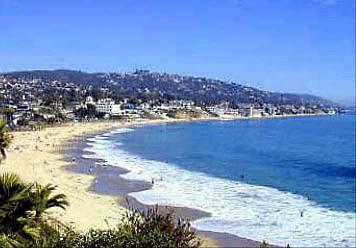 Laguna Beach, October 27, 1993. 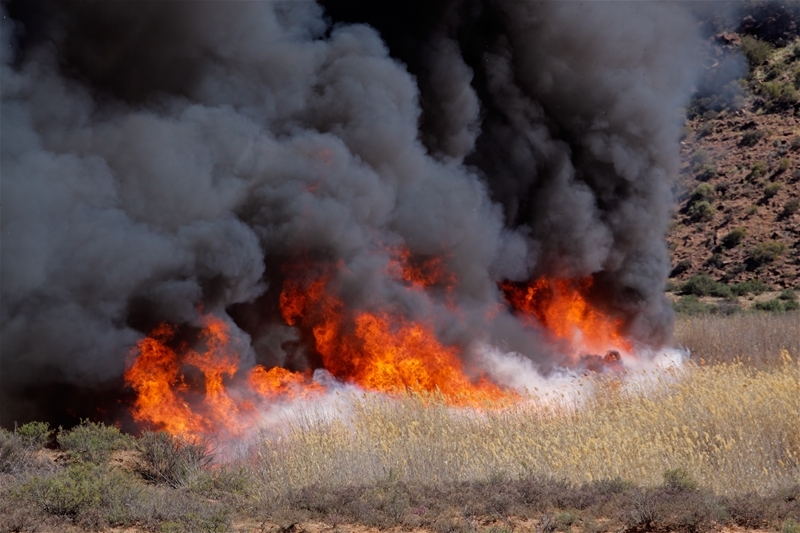 As fierce wildfires fueled by 70 mph Santa Ana winds swept through the Laguna Canyon and hurtled towards their neighborhoods, people found themselves literally racing to escape the 200-feet-high flames. When it was over, the fire had claimed 366 homes. Excerpt from my, 1993, Diary, unedited. Post - Oct 27. I laid there, in my boiling hot room, and sorted out my day. The first thing I had to do was call Barbara - my neighbor across the street - and see if she put the copy of my William Morris book contract, in my mailbox... so I could take it to school, and go over it. My Attorney had faxed it to her husband Mark's office and he was nice enough to bring it home for me. I knew it was going to be a difficult day, because of the heat, and my back was still killing me. My face too, was dry, itchy and pealing, because I'd just had another deep face peal, and couldn't wear make-up again today. I wished I could stay home and hide, but I had to get the contract figured out and faxed back to David by the end of the day. This time, I was determined... nothing would stand in the way, of me writing my book. Before Georgia left the house for school, she turned on the T.V., and I heard the reporter say, Orange County was on fire. 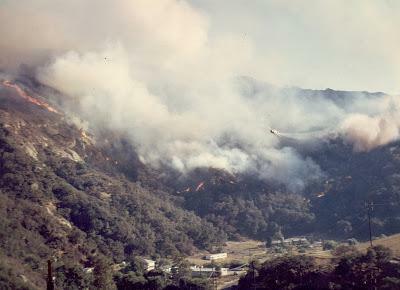 I'd heard this before, but was never alarmed.....I figured we were safe here Laguna, tucked away from the rest of the county in a Lagoon..... but when I got up, and looked out the window, I was stunned by the amount of smoke in the air and how the sun looked like it had turned to blood. Than I noticed Mark and Barbara's roofer's, working at 7:00 a.m., and worried about the hot tar blowing in my windows. I knew I couldn't stay in the house with the windows shut all day. The heat would kill me. 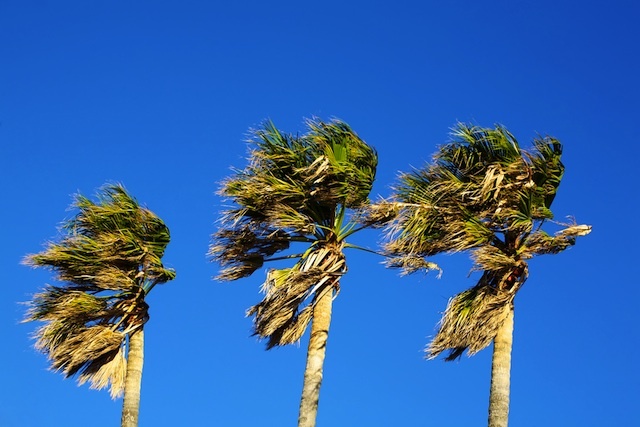 The Santa Ana winds were out of control, blowing 90 miles an hour, or so it seemed, by the look of the palm trees swaying in the wind. I forced myself to get dressed, and get out of the town as soon as possible until it blew over. 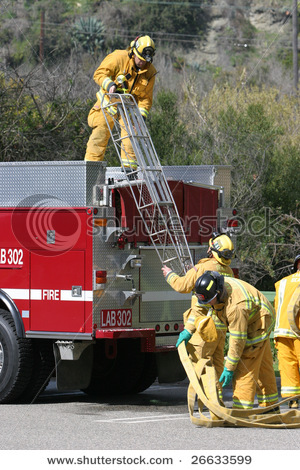 Before I left, I called Barbara and told her the roofer's had an actual fire going on her roof, but figured they must know what they were doing, so didn't worry too much about it. We talked about the brand new Black Cherokee Jeep, she'd just gotten, and I remarked on how spoiled she was, having a rich husband, who buys her anything she wants. "Oh, I know," she agreed, "isn't it terrible, how spoiled we both are," she laughed, throwing it right back to me. "Well, I suppose you're right," I said, "I'm very lucky too, after all I get to spend the day doing aerobics, Yoga and Tie Chi, than study my contract while eating lunch." We both laughed, knowing that few people had a lifestyle as comfortable and as fun as ours. "What do you think about the fires," I asked her, needing some reassurance before I headed out of town. "I'm worried, of course," she confessed, "but it looks like they're pretty far North, don't you think?," she said. "You're right," I said, "but doesn't it look like the end of the world? I've just got to get out of here." "I'm so sorry," she said, "about the roof. They were supposed to be done a week ago, but you know contractors, you can't depend of them." "It's okay," I said, "I need to get to school anyway. 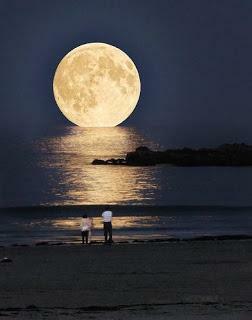 I've missed the last two days of exercise classes, because my back went out." "Well, good luck with the book contract," she said, "I'm excited for you. I know the project is going to be great, how can it miss, the story is phenomenal"
"Thanks Barb," I said, "and thank Mark for bringing the fax home." I got off the phone and called David next to tell him everything was on schedule and that I'd call him in the afternoon when I got home. Than I threw on some old cotton shorts, a crummy t-shirt without shoulder pads, and some tennis shoes. The house looked neat, and clean. Everything was in order. My manuscript, family pictures, and letters, all filed in boxes and stored under my desk next to the door. I walked out the front door and down the old red brick steps to my car, than hesitated for one second, wondering if I should bring the pictures with me to decide which one's would be best for the book. Than thought, "no, leave them, they're safer in the house and I wouldn't want to take any chances of losing them." I pulled the car out of the garage, locked it tightly with the new pad lock I just bought and backed it out of the driveway. 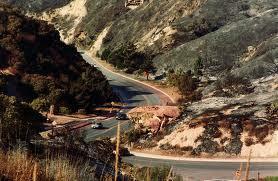 Before I drove off down the hill, I looked back to admire the new paint job, and landscaping. It was just darling and I was proud I'd restored it to it's rightful position in the neighborhood, after years of neglect during my long divorce. I dreamed about the day I could finally build a second story on it and have a perfect view. 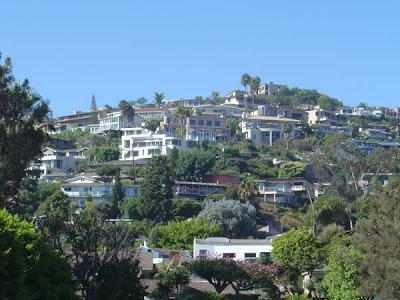 As I drove through Laguna Canyon, at 11:15 a.m., I noticed police cars, than saw the police putting yellow cones in the highway, to stop traffic from coming into town, it concerned me, but not enough to turn around and go home. How strange, I thought, as I sped past them. I looked in my rear view mirror and vowed not to worry, I'll be home at 5:30, I said to myself, and everything will be fine. Georgia was dressing for P.E. and going out to play soft ball on the field, when she looked up at the sky towards our house, and noticed it was blue and purple, with scarlet clouds... too eerie to be beautiful, and yet amazingly hypnotic, she thought. The other kids were singing, "it's the end of the world as we know it"... even though, at that point they really didn't know a thing. There was a scary tension in the air, but the P.E. coach kept everyone playing outside, in the horrible heat. By lunch, it was clear there was a problem and out in the distance Georgia, could see a cloud of black smoke slowly getting bigger and bigger, right over the town. Reports of a fire in Emerald Bay, a few miles North, began to filter across the campus, and though nothing was confirmed until she got to her 5th period class..... she knew it wasn't good. Finally the word came that Laguna was on fire......but not to panic.